Graham is "over 50" and a self-employed web developer. In his early twenties he achieved the grade of 1st kyu (brown belt) in Taekwondo before stopping training due to injury. He started his aikido training in 2002 at the Bicester Aikido Club which was headed at the time by sensei Vincent Sumpter (6th dan). Following sensei Vincent's relocation in 2005 the club has been under the guidance of sensei Martyn Tyas (3rd dan). Graham was awarded his black belt in February 2009 during a visit to KSK Italy (Yomi Shin Tai) and his 2nd dan in April 2011. 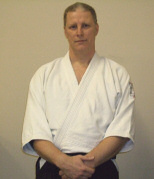 Graham founded the North Cotswolds Aikido Club in 2012. In April 2018 Graham achieved the rank of 3rd dan.